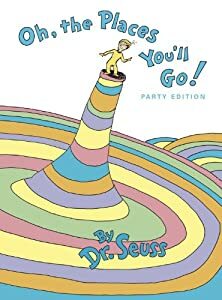 Cover of Oh, the Places You’ll Go! This excerpt is from the Dr. Seuss book “Oh the Places You’ll Go”. I love this book because it empowering and encourages world exploration. To remember that change may come, things may happen that you dislike, or you may not understand why something happens just be positive get back on your feet and try again. I think the ending to this book is great to close my blurb with. Ok….what is this Dr.Seuss blog about you might ask? Every year I give a children’s story assignment to my ASL students. Some of the books students choose are fabulous but the number one desired author for this assignment is Dr.Seuss. Dr. Suess is an entertaining and creative writer however; sometimes his books do not lend themselves well to conceptual ASL. I have tried to figure out how to get students to understand the importance of visually performing a Dr.Suess book whose language can be twisty-turvy at times and conveying it clearly in the wonderful signed performance at their level of course. Today, I saw Keith Wann’s Dr. Suess video in ASL it was fantastic. I am already a fan of his and the great comedy he produces so it was a joy to see this and I will show it as an example to students of how a Dr.Suess story can be performed. The book he signs is “Oh the Thinks You Can Think”. Enjoy!! !